Raising the preferred middle digit, the quintet—Ivan Moody [vocals], Zoltan Bathory [guitar], Jeremy Spencer [drums], Jason Hook [guitar], and Chris Kael [bass]—fuel the beating bloody heart of 21st century hard rock. Arriving with a bang in 2007, they’ve unleashed a total of three RIAA platinum-certified albums, three gold albums, a platinum single, and generated 2 billion global streams to date (in this century). As they became “one of the most-streamed rock acts in the world,” 2015’s Got Your Sixcatapulted to #1 on the Billboard Top Rock Albums Chart and #2 on the Top 200. Recognizing their staunch commitment to supporting the military, The Association of the United States Army honored the boys with the prestigious “Soldier Appreciation Award.” Moreover, they’ve graced the covers of Revolver, Metal Hammer, and Kerrang!, to name a few. Backed by sky high flames and blockbuster production befitting of their ambition, no crowd has been safe—from Download and Rock Am Ring to Rock on the Range and Jimmy Kimmel Live! On international headline runs, millions of “Knuckleheads” congregate at sold out arenas everywhere. This unbelievable story continues in 2018 with their seventh full-length the aptly titled, And Justice For None. A brash bloodletting of airtight riffing, muscular grooves, and seismic melodies, these 13 tracks see Five Finger Death Punch maintain that signature intensity, while getting ballsier, bolder, and bigger. Once again, the group hunkered down in its home base of Las Vegas with longtime producer Kevin Churko [Ozzy Osbourne, Disturbed] behind the board a year after Got Your Six. In the studio, they collectively stepped up their game as a unit. A cinematic cover of The Offspring’s “Gone Away” introduced this chapter. The orchestral darkness underscored Moody’s haunting and hypnotic delivery as the track clocked over 8.8 million Spotify streams and 18 million YouTube/VEVO views in a few months’ time. Next up, “Sham-Pain” kicked down the doors as the first single. A guttural guitar gallop charges ahead as the frontman rails against detractors and trolls of all kinds with clever and catchy soul over an unpredictable beat. “Ivan was going through something personal, and he was just venting,” the drummer elaborates. “There’s a cool shuffle and a different vibe, which is something we’ve never done. It’s a great way to introduce the record. Ivan’s like the ambassador of anger,” he smiles. The musicians tracked the punchy and potent “I Refuse” in a backstage locker room, capturing raw intensity in the moment. Meanwhile, “When The Seasons Change” touts the most massive melody in their catalog yet upheld by expansive acoustic guitars and keys. The most surprising outlier comes in the form of battering ram blues on the Kenny Wayne Shepherd cover “Blue On Black.” Distorted guitars curl around pummeling percussion before bleeding into a swaggering chant. 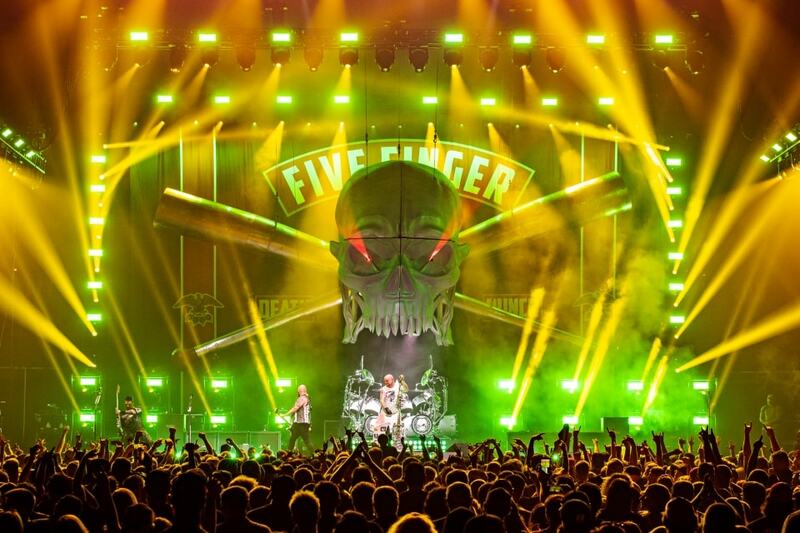 In the end, Five Finger Death Punch have only just begun to leave their mark on rock music with And Justice For None.